Today’s post celebrates the arrival of the June solstice. 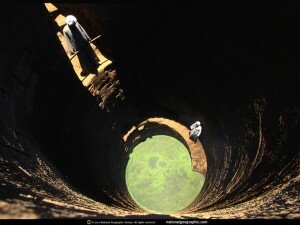 The image above shows a measuring well in Aswan (Syene), Egypt. Aswan is situated such that at high noon on the solstice, the sun appears directly overhead. If you stand a stick straight up in a pile of sand, you won’t see its shadow. If you lean over a well, you won’t cast a shadow on the water because the sun is directly overhead. If you repeated this behavior the next day, and the day after that, and so on, you would see slivers of shadow appear and gradually grow larger as the days passed. It was just this observation that inspired Eratosthenes’ legendary calculation of the Earth’s circumference. Eratosthenes was already in the habit of measuring the shadows cast in his hometown of Alexandria at noon on the solstice. When he noticed the lack of shadow in the southern city of Syene at the same time of day/year, he realized he could use the angle of the shadow in Alexandria to calculate the angle between the two cities as measured from Earth’s center. A few applications of geometry later, he arrived at a decent estimate of Earth’s circumference. Click on the image above to download the wallpaper. Unfortunately, it’s only available in two sizes. To make up for that deficit, I’m giving you something even better: a link to Carl Sagan’s explanation of Eratosthenes’ work. Get a free blog at WordPress.com Theme: Freshy by Jide.